General Mills dropped a sort of new cereal on Wednesday. A new version of Lucky Charms was released, and it's called Lucky Charms Frosted Flakes. 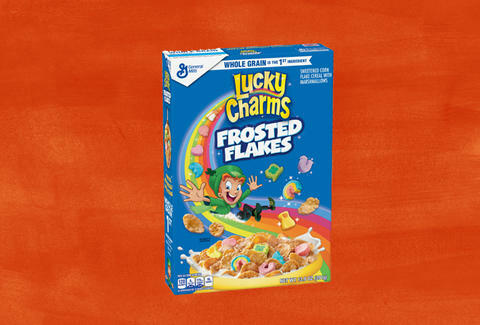 At first glance, it's obviously a mash-up of Lucky Charms and Frosted Flakes. Right? It is Lucky Charms with the non-marshmallow portion (you know, the part you didn't eat as a kid) replaced by frosted corn flakes. However, Frosted Flakes cereal is owned by Kellogg's, so it's not an official mash-up. The logical next question would be why does the "frosted flakes" portion of the box look an awful lot like the text on a box of Frosted Flakes. That's not really clear, but it seems like General Mills is not so subtly trolling a rival. This can happen because the name Frosted Flakes isn't trademarked, as noted previously by Serious Eats. It's a description. That means General Mills is free to make this slightly confusing, but delicious-looking resolution-breaking cereal. The boxes have hit some shelves already, but General Mills says the cereal will be available at "major retailers nationwide" over the course of the month. It's going to be joined by a couple other General Mills hybrids: Peanut Butter Chocolate Blasted Shreds and Cinnamon Toast Crunch Blasted Shreds. Both are basically sugared-up shredded wheat. Surprisingly, the new Lucky Charms Frosted Flakes contains the least sugar of the three kinds of cereal. Maybe that's your excuse for eating six bowls tomorrow morning.